Background In line with the changing role of community pharmacists, we describe here a standardised procedure for detecting DRPs in elderly patients for use in community pharmacies. Objectives The primary aim was to describe the number and type of DRPs identified by community pharmacists in elderly patients. Secondary aims were to determine the number and type of associated pharmacist interventions (PIs) that were transmitted to the prescribers, and to identify risk factors associated with the occurrence of a PI. Setting Community pharmacies. Methods In this prospective, multicentre study, pharmacists received patients aged 65 and over. During a 30-min interview with patients who agreed to participate, patient characteristics were recorded such as age, weight, height, frailty (using the Short Emergency Geriatric Assessment grid), estimated renal function and compliance with treatment assessed by the Girerd scale. Main outcome measure DRPs characteristics. Results A total of 892 patients agreed to participate in 55 pharmacies. Among them 334 DRPs were identified and were associated with 259 PIs. Eighty-nine PIs of 259 were sent to the prescribing physicians; 70 (78%) were implemented by the general practitioner. Factors associated with the occurrence of a DRP are compliance problems [odds ratio (OR) = 1.8, 95% confidence interval (CI) (1.26–2.58)], frailty [OR = 1.3, 95% CI (1.01–1.66)], number of prescribed drugs per day [OR = 1.46, 95% CI (1.02–2.07)] and GFR < 60 mL/min [OR = 1.49, 95% CI (1.01–2.2)]. Conclusion This is the first standardised pharmaceutical assessment dedicated to the elderly carried out by community pharmacists in France. If implemented, it could help to find drug-related problems, identify frail elderly patients and ultimately decrease their exposure to iatrogenic medication errors. 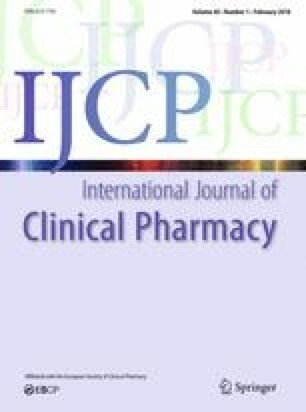 The authors wish to thank students and community pharmacists who participated in this study, the representatives of the bodies which supported them, the administrative and medical staffs of the Bertinot Juel Hospital Center in Chaumont-en-Vexin, who actively participate in reflections on clinical pharmacy. This study was funded by the Agence Régionale de Santé de Picardie, the Collège Régional des Pharmaciens Maîtres de stage de Picardie, the Association de Pharmacie Hospitalière de l’Oise, la Somme et l’Aisne (APHOSA) and the Bertinot Juel Hospital Center of Chaumont-en-Vexin. Authors declare that they have no conflict of interest. Christensen M, Lundh A. Medication review in hospitalised patients to reduce morbidity and mortality. Cochrane Database Syst Rev. 2016;(2):CD008986. https://doi.org/10.1002/14651858.CD008986.pub3.